Twirling at a smaller school still has the perks of a big school - the chance to twirl, pushing the envelope with fun tricks, bonding with your marching band and making memories that will last a lifetime. 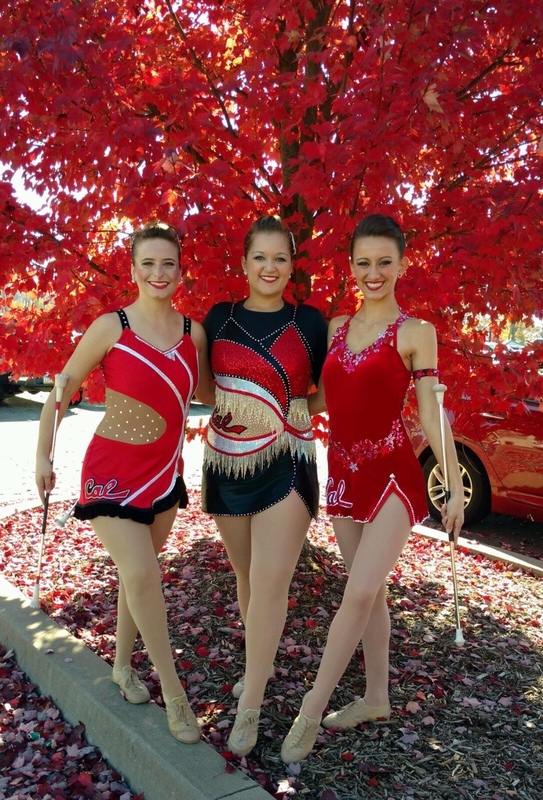 Don't take it from us though... this week's Twirler Tuesday introduces the three feature twirlers from California University of Pennsylvania and they're here to tell you all about how they made their dream of twirling in college come true. KK: My name is Katherine Karlic from the California University of Pennsylvania. I have been twirling since the age of eight. I have been a part of the Shining Stars group in Niles, Ohio, then moved to Pennsylvania and pursued my talents in the Sensations Marching Unit. They are located in Pittsburgh. I was involved in the TIA/TOB championships and won gold with their open team. I have been twirling as one of Cal U’s features for three years now. OE: My name is Olivia Ebersole, I’m from Granville, Ohio and I go to school at California University of Pennsylvania. I began twirling at nine years old, but did not start individual competition until I was fourteen. I compete USTA, NBTA and TU. I was the feature twirler at my high school for five years and this is my first year as a feature for Cal U of PA! I twirl with the wonderful Billy Bruce and compete at AYOP every summer! I have several Ohio State Championship wins and one National Open win. MT: Megan Teres, Charleroi, Pennsylvania, California University of Pennsylvania. I began twirling when I was twelve years old. I started out in a parade group but quickly realized I wanted to compete. I started to take lessons at Ruby Daugherty and Sherry School of Dance, home of the Modernettes Twirling Corp. I took lessons at the studio for five years, two of which I was a member of the Modernettes. Currently I am being taught by a former Cal U Feature Twirler, Brittany Marcolini. This is my second year as a Cal U Feature Twirler. CMB: What’s your favorite memory being a part of your college marching band? 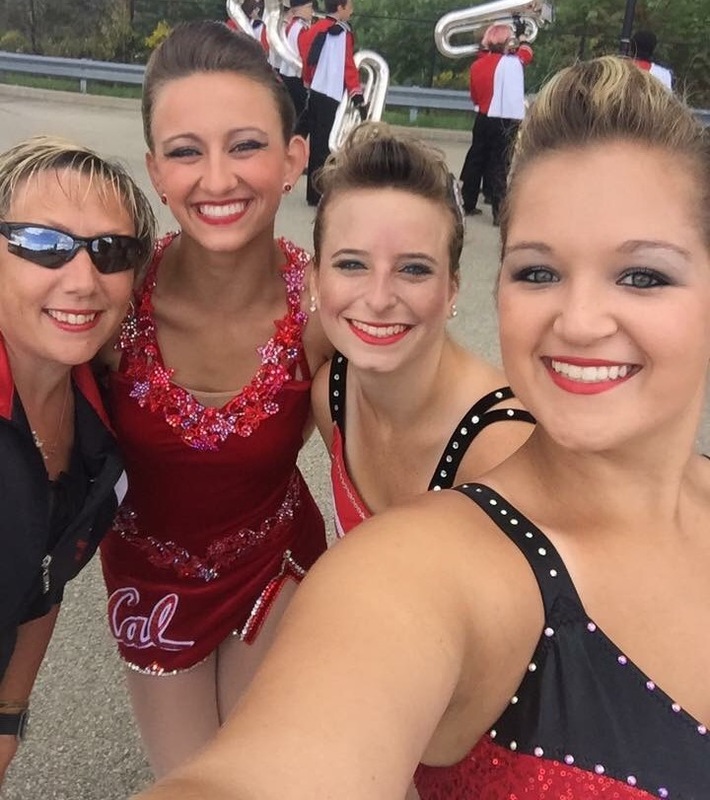 KK: My favorite memory from being in college marching band is getting close with the twirlers at band camp. We get to explore our talents, and form a new show with a fresh start. OE: My favorite memory of being part of my college marching band is participating with the Alumni at the homecoming game. Getting to see such an amazing group of twirlers including Donna Wassilchalk, Brittany Marcolini and many more, was a wonderful experience I won’t forget. Getting to witness so many Alumni coming back to play with the band was amazing, and I will always remember the sense of family that day had even with the cloudy sky and rainy weather. MT: My favorite memory being part of my college marching band is the first time I performed with the band last year. My favorite part about the performance was twirling fire. OE: One time at band camp I caught four baton stacks and the entire band cheered for me. It was the highlight of my day and the smile on my face wasn’t from catching the trick, but because of their appreciation. MT: One time at band camp I hit the back of my leg with my baton and had a bruise the size of a softball for weeks. 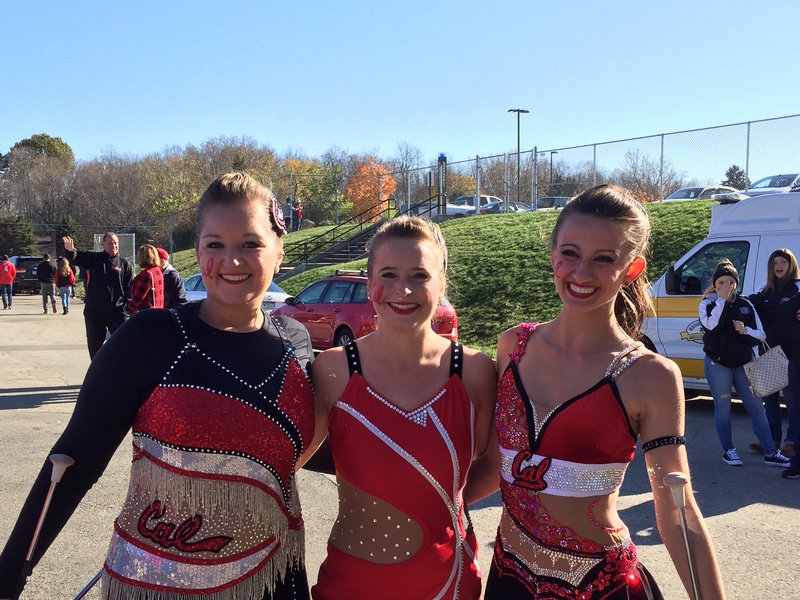 KK: One of my favorite accomplishments is truly making the feature twirler group here at Cal U. It was an honor to be recognized as having the kind of talent that the rest of these girls have. They are incredible. After I was rejected my freshman year, I did not give up. I continued to practice and push my limits, and the next year, and every year after, I made the features. OE: My favorite accomplishment is gaining a feature position here at Cal U. My favorite part of twirling is the field shows and I absolutely love my band. To accomplish this dream it took dedication, hard work and lots of hours outside on the tennis courts. MT: My favorite accomplishment in my twirling career was being chosen as a Cal U Feature Twirler last year. Throughout my entire twirling career I knew I wanted to be a feature twirler for a university and made this my goal. I practiced several days a week for years to be where I am today. I competed at several contests every year including states and regionals. With all of the contests and high school performances I have twirled at, I can honestly say twirling at college football games as part of the Cal U Marching Band is the highlight of my twirling career. 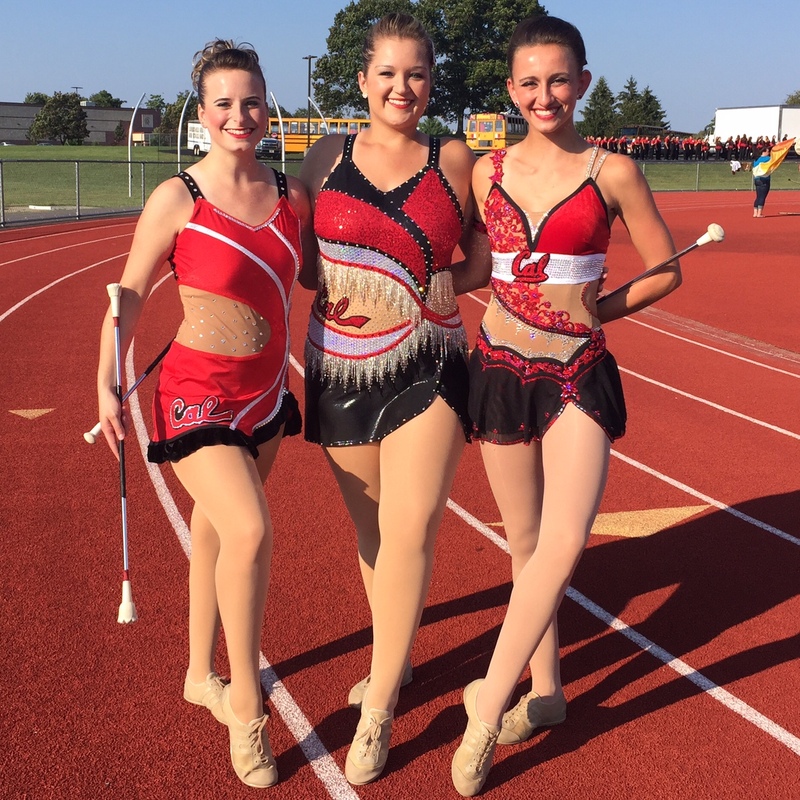 KK: As a high school twirler, if you take twirling seriously, and have a burning passion for it, then strive for a college that has a great twirling reputation. If it means that much to you, you won’t let that fire burn out. OE: When looking for a college to twirl at one of the major things I thought about was if the school had a twirling advisor. Cal has an amazing advisor, Donna Wassilchalk. Donna not only helps us with the show and new tricks but has become a best friend, someone to help me up when I’m down. I also would tell them to think about size. Going to a big school has great perks on the field, one gets to perform to tons and tons of people and to be the face for the school. Smaller schools also have their perks. Performing in a stadium where you get to see the audience's faces and really interact with them is one of my favorite things. MT: The most important advice I have for high school-aged twirlers for deciding which school to go to is to choose a school based upon if the school is right for you. Choose a school that has the field you want to major in. Also, make sure you love the school you choose to attend. It just so happened for me Cal U has a great Communication Disorders program and they have an amazing band who has Feature Twirlers. KK: Before a game starts, I always have to give myself an ultimatum. I know that sounds ridiculous, haha! But, if I actually relax, I will have a terrible show. I need to put the pressure on myself, and talk to myself, to make sure that the pressure stays on throughout. It works, believe it or not! OE: Megan, Katie, Donna and I have a ritual of locking our pinkies before a show. It’s a great way to show support and wish each other luck. KK: No question, if I had to live on one food for the rest of my life, it would be popcorn. I can’t get enough of that salty, buttery snack! OE: Hands down I would live on McDonald’s chocolate chip cookies. KK: Don’t be afraid to push your limits. Even if your college just has a majorette team, continue to practice, and see what you guys can do maybe next time on the field! OE: I would tell them to always take a moment to soak it all in because it goes by in a flash. As a freshman I cannot wait to have so many more experiences twirling for my school. These are the memories that will stay with me forever, and I don’t want to miss a moment. I would also say to remember how important the band, guard and instructors are in providing a wonderful experience for the crowd. There is so much that goes into marching band and so many wonderful people who deserve all the thanks in the world. MT: Don’t get frustrated when trying new tricks or creating a routine because the purpose of performing with a college band is to have fun. KK: I actually did not pay much attention to college twirlers as a young one. I didn’t think I would pursue twirling after high school, but once I saw the twirlers at Cal U, I knew I wanted nothing else. OE: I always looked up to Julianna Johnson, who was both a Sliver Twin and the Girl in Black at Purdue University. She is always kind to me, and gives baton twirling a great name. She is an outstanding twirler and a beautiful girl inside and out. Julianna is a perfect representative for her school. I have also always admired Merri-Frances Dmitrzak who was a twirler at Marshall University and now twirls at Baylor University. Merri-Fran was welcoming and kind to me from day one. She is open and warm to everyone she meets and not to mention has a great sense of humor. Her twirling abilities never fail to amaze me, and she is also a great representative for twirling and her school. MT: When I was a young twirler I looked up to Karrissa Wimberley, and I still do to this day. When I first saw videos of Karrissa twirling she was a feature twirler for FSU. I admired Karrissa because she has a very fun, unique twirling style and is not afraid to try new tricks. KK: Well, unfortunately I am a senior. I will try to push through for the rest of our season and stay proud of what I can achieve, but I know that there’s no “trying new things” for me, haha! I’m a bit old. I think I’m going to through in the towel for my professional twirling aspect, but I will still mess around recreationally! The passion will never die out. Outside of twirling, I will be graduating with a degree in Economics. I hope to be successful in doing what I love. OE: I plan to continue my path to obtain a degree in Public Relations here at Cal U. As for twirling I will continue to twirl not only for the Vulcans football team but also for other Cal sports; indoor and outdoor. I also plan to continue competing both under Cal’s name and as an individual twirler. MT: I am currently a sophomore and will continue to twirl for the remainder of my undergraduate degree. I would love to twirl during the two years of my graduate degree but I am not sure if I will. Once I graduate from graduate school I plan to be a Speech Language Pathologist in a hospital or nursing home setting. Anything else that the fans of CollegeMarching and CollegeTwirling should know? KK: You can always achieve your dreams, just work hard, keep the passions of fire lit, and reach for the stars. Anything is possible. OE: Remember every moment because being in band not only lets you enjoy your sport but also provides a second family and the best of friends. Also I would like to give a shout out to the Vulcan Football Team for having such a wonderful season! Go Vulcans! MT: Hard work pays off! Never give up on your dreams.